The Archipelago of San Andres y Providencia was discovered in 1629 by English Puritans. For 200 years the English, Dutch, French, and Spanish advanced rival claims to the islands. In 1793 the English recognized Spanish sovereignty in the Treat of Versailles. However, even today English is spoken on the islands. In 1822 the islands joined the Gran Colombia. The Archipelago of San Andres and Providencia include the islands of San Andres, Providencia, Cape Quita Sueño, Cape Rocador, the Banks of Serrana and Serramilla, and Bajo Novo. They are also claimed by Nicaragua. Additionally the Bank of Serranilla has been claimed claimed by Honduras and the United States. In 1953 San Andres was declared a free port. 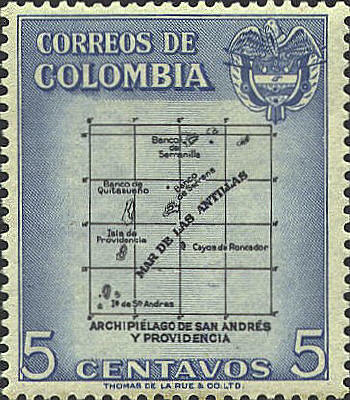 The stamp was issued in 1956, and the map design appears on several stamps of different values in the same set.